Raising children is the most difficult task I have ever undertaken. I am responsible, not only to nurture and protect my children, but to teach them how to be responsible and caring adults for the future. I am in charge of their physical and spiritual bodies. As a family, we work on good habits using a simple goal and reward system. With my oldest children being 7 and 4 it works well for us. The focus of the system is positive reinforcement. 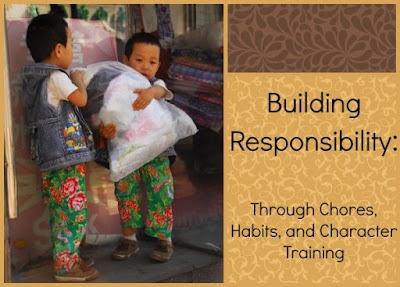 Together, my husband and I pick a habit or trait to train for each child. We ask the kids for a reward and we make a simple countdown calendar to use. We use Do-a-Dots to mark off our countdown. For my son, we wanted him to have proper work ethic in math class. We wanted him to be consistent, methodical, and diligent. Each school day he exhibited those traits without giving up, he was able to mark off on his countdown. His reward was a stuffed snow leopard from the zoo. He had to work for three months to get this, which helped him establish a new habit. When my daughter was younger, we wanted to establish proper potty training habits. 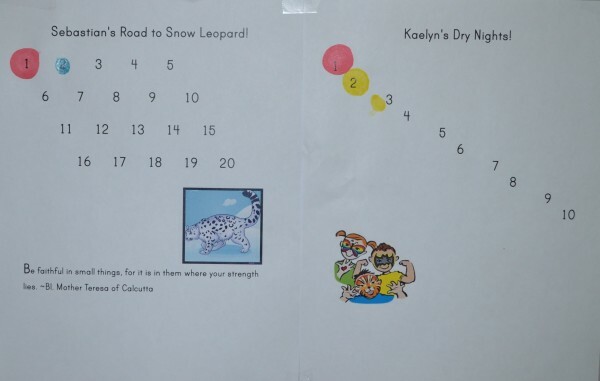 She had a similar countdown that she was able to mark a sticker for each day she had dry pants. Her reward was face painting at the zoo. This is a very simple way to get kids excited about breaking a bad habit or starting a new habit. Some other ideas include: books read, homework completed, days practiced for an instrument, feeding a family pet, etc. The ideas are endless. The hardest part is having an appropriate reward. Rewards include: trip to the zoo, ice cream sundae bar, a play date, etc. Another way to build responsibility with kids is to have chores. Putting up charts is an easy way to show clear expectations. My nine-year-old son can easily read so I write his chores down in his planner. My six-year-old daughter is not a strong reader yet, so we use pictures to help her remember her chores. We have a mix of written chore charts and picture chore charts for the kids. They have morning, afternoon, and evening chores which don’t take more than 5-10 minutes to complete at any one time. It is just enough work to give them responsibility and learn habits for an organized life. As a parent of younger children, I am vigilante in setting the hearts of my kids on the straight path to God. It can be hard because I have to fight against the bad influences in this world, but God has entrusted these beautiful souls into my care. Through the graces He gives me, I shall build their character and train them to be warriors for our Lord. My favorite way to instill virtues into my children is to have them memorize Bible verses. The Word is placed on their heart and they can pull from it in times of need. We help them memorize the verses by making a memory verse notebook. We work on a new verse every week and write it down in the notebook so it is easy to reference for review. We also put the verses on notecards for flashcard games. I have learned many verses along with the kids. My daughter likes to put the verses to music. My son likes to put the verses to movement. They have different styles to learn the wisdom in their own ways.